Here is the first of a series of short extracts from books in the Reverb Series: from David Treece’s forthcoming (May 2013) Brazilian Jive: From Samba to Bossa and Rap. From the second chapter, ‘The Bossa Nova Revolution: suspended animation and the tempo of Brazilian modernity’, in this section, David considers the ‘ecological rationality’ of the bossa nova and the songs of Antonio Carlos Jobim (Tom Jobim). My starting-point is to remember that all sound consists of movement and change — pulses, or cyclical waves of energetic flux and reflux, transmitted via the medium of air and registered as physiological alterations in the anatomy of our ears; as these changes are translated into electrical impulses, firing off neurons in the brain stem and the auditory cortex, they trigger complex networks of memory, connection and alteration which we perceive as transformations in our acoustic environment, and to which we can react in turn, physiologically, emotionally and mentally. If sound is to be understood in this way, as the process by which the effects of movement and change in the external environment are internalised and incorporated by the conscious human body, then music structures and organizes this phenomenon in such a way as to dramatize (to make us undergo in a heightened, concentrated and intensified way) the experience of transformation, of movement from one state of being to another. In that sense, as José Miguel Wisnik reminds us in O Som e o Sentido (Sound and Meaning), what we perceive distinctly as rhythm, melody, harmony and timbre are simply different manifestations of the same phenomenon. The regular energetic pulse that, up to 10 hertz or cycles per second, we still perceive only as a beat, begins to be heard as a ‘note’ from that threshold onwards, as the acceleration of a pulse’s frequency turns quantitative into qualitative change, translating the temporally perceived vibration into a spatially perceived vibration; what is really a variation in time, the acceleration of a pulse, is heard as a vertical relation of pitch, the up and down of melody, as the rising frequency of the sound wave is experienced as an ascent away from the gravitational inertia of the earth. These spatio-temporal variations, which are then heard ‘horizontally’ as successive notes in a melody, can of course be sounded simultaneously, in the vertical structures we call harmony, while the unique combination of additional, natural overtones or harmonics, which each musical instrument produces when it sounds a single tone, accounts for the distinctive timbres or textures of musical colour. And these basic elements of musical creativity, all of them different expressions of the fundamental phenomenon of movement — the pulse —, can then, in their turn, set in motion ever more complex dramas of change and transformation, of harmonic modulation and tonal development. If all music is structured, meaningful sonic movement and change, then, we could ask: what specific kinds of movement animate the distinctive musical universe of bossa nova? The concept I propose here to characterize the bossa nova aesthetic — suspended animation — is intended to encapsulate a certain paradox of dynamic equilibrium, a delicately sustained integration of contrapuntal forces shifting endlessly between tension and resolution. Furthermore, this dynamic equilibrium, which to my ears is the source of bossa nova’s almost hypnotic, incantatory fascination, cannot be abstracted from the act of performance, because it resides precisely in the effort to incorporate and sustain, in real time, that live interaction and tension between the vocal articulation of melody, the rhythmic and harmonic sequences played by the guitar, and the lyrical unfolding of the song’s internal, structural logic. This internal cohesion integrating all its constituent elements — formal, performative and semantic — makes it problematic to isolate a separate ‘bossa nova rhythm’, to sing a lone, unsupported ‘bossa nova melody’, or even to perform bossa nova songs ‘in translation’ — the whole is so much more than the sum of its parts that, when heard alone, each constituent element can sound weak and unremarkable. The sense that the bossa nova aesthetic posed a radical, if subtle and underestimated, challenge to traditional musical sensibilities was present from the beginning, and often self-consciously so, to the point of being incorporated thematically into the lyrical and musical content of certain songs. 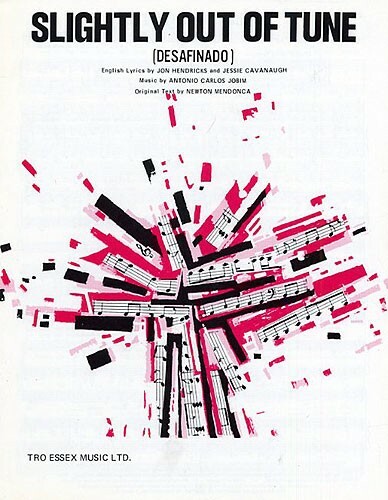 The Jobim/Mendonça composition ‘Desafinado’ (Off-key), first released by João Gilberto in 1958, can be viewed almost as a manifesto of the new wave — the formulation ‘bossa nova’, literally meaning ‘new flair’, is directly referenced in its lyrics which, adopting the idiom of an injured lover’s protest that he is misunderstood voice a witty defence of an original way of singing. Don’t you know it’s hurtful for a guy like me? We could characterize the idiom arising out of this structural logic as an ‘ecological rationality’; that is to say, the subjective and objective life of the individual, the flux of human experience from the projection of desire towards its satisfaction, and the musical unfolding of the song itself, all seem to be ordered by the same ‘natural’ cycles and relationships. Operating through a continual dialogue between lover and beloved, self and world, lyrical argument and musical form, the songs enact a kind of harmonization of time, space and consciousness in which the musical drama, its human actors and their natural settings converge towards an equilibrium of intimate communion and understanding, a magical state of ‘grace’. Tom Jobim’s personal commitment to this idea of the song as a medium of integration between self and natural world was an explicit, consistent feature of his work. One of his finest compositions, ‘Águas de março’ (March rains), identifies ‘the promise of life in your heart’ with the eternal rhythms and cycles of a rural landscape, in an endlessly circular melodic and harmonic structure. Indeed, Jobim’s ecological perspective became an increasingly active political concern up to the end of his life, when he was a prominent supporter of the movement to defend the last areas of original forest on Brazil’s Atlantic coast. The cultural environment which the first generation of bossa nova artists inhabited in the Rio de Janeiro of the late 1950s, meanwhile, sheds further light on this philosophical dimension of their music. Prior to the rise of Marxist and left nationalist ideas, one of the chief intellectual influences on that generation was French existentialism. In literary circles, for example, the presence of this current of thinking could be keenly felt in the work of one of the period’s most successful young writers, Clarice Lispector. The idyllic, semi-rural tranquility of Rio’s southern beachside neighbourhoods in those years, safe as yet from the economic and social explosion that would soon transform the urban landscape, must have offered an ideal objective correlative for the kind of inner spiritual integrity, the grace-filled enlightenment of ‘being in the world’ that Lispector’s characters strive to discover. It is that striving for wholeness, for completion of the self in the other, in the rhythms of nature and in the rationality of musical form, which defines the ‘liturgical’, magical quality of the classic phase of bossa nova composition and performance. So, in Jobim’s ‘Corcovado’ (Quiet Nights), Rio de Janeiro’s mountain landscape forms a natural objective correlative for the unity of self and world, viewed through a window of contemplation from within a domestic space of intimacy. A circular structure beginning and concluding on the same unresolved Am6 chord holds suspended together the principal melodic theme and a series of complementary ideas — ‘A little corner, a guitar/ This love, a song/ To make happy the one you love’ — that have replaced the dying flame of a former sorrow with the eternity of new companionship.